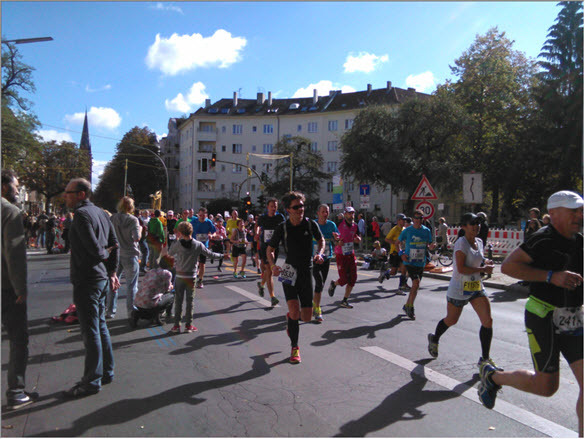 My weekly marathon training runs usually consist of me running 30+ kilometers alone through Berlin, but today there were 41,000 of us. 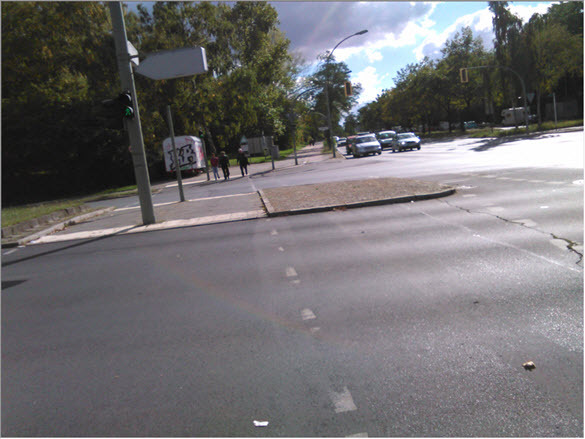 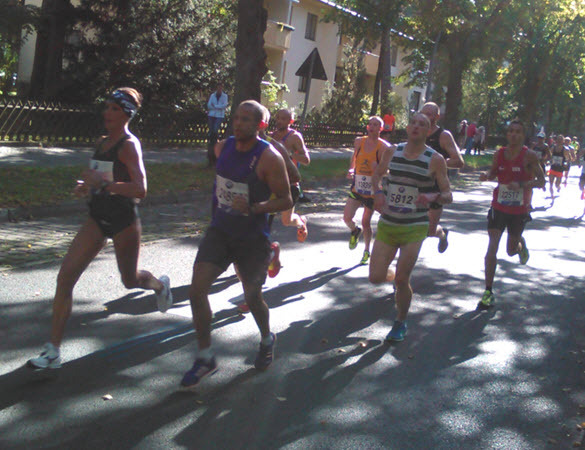 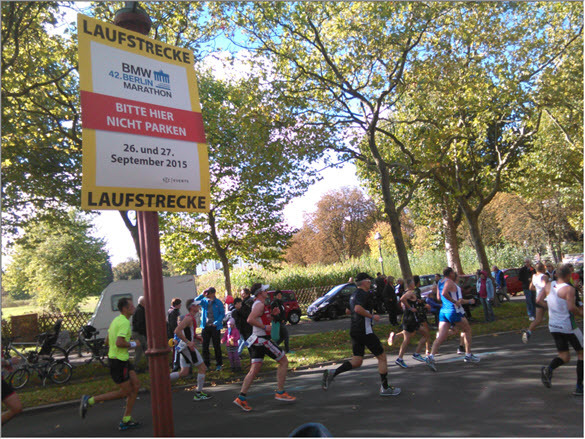 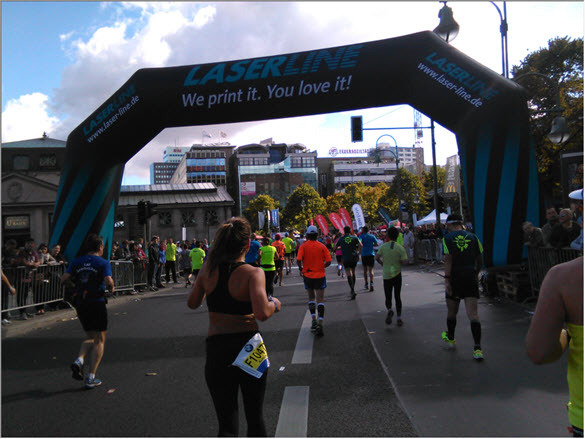 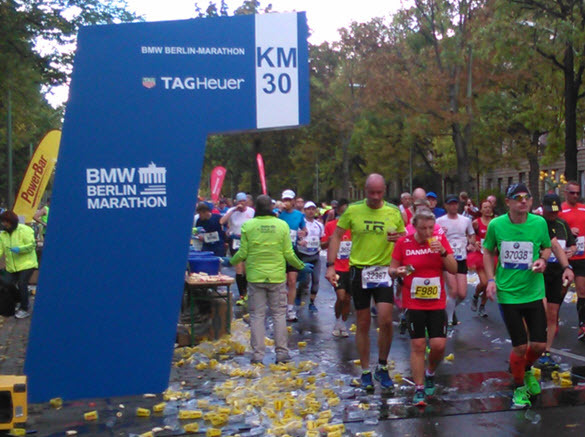 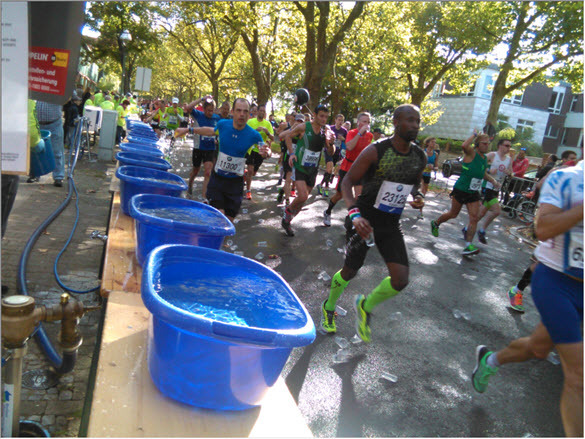 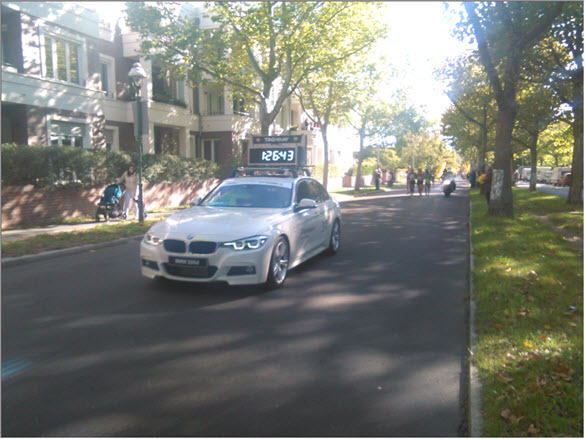 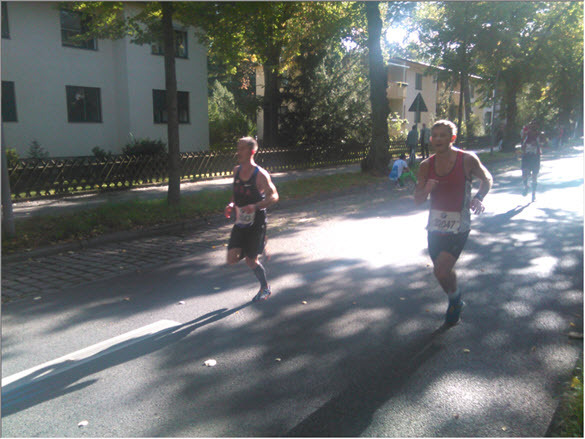 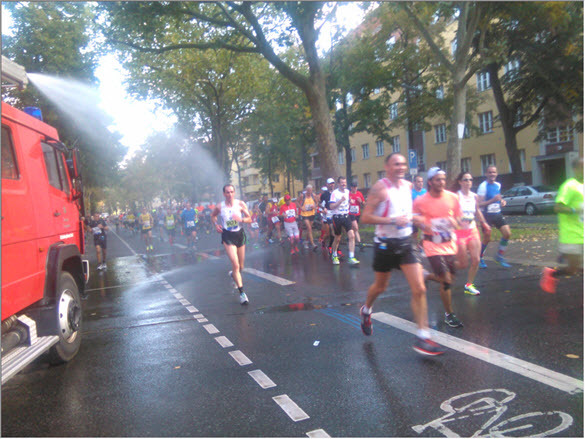 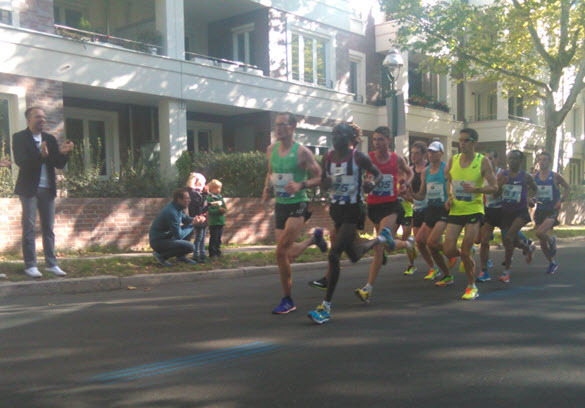 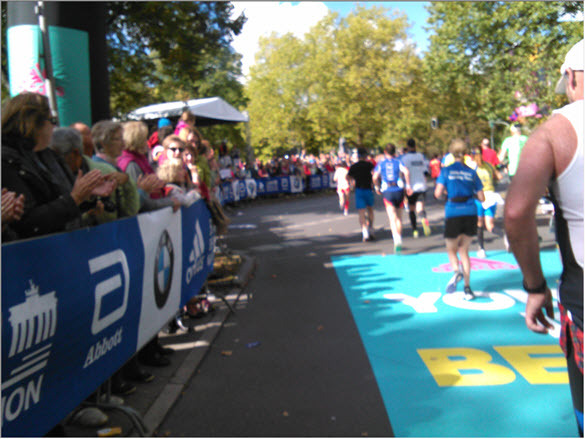 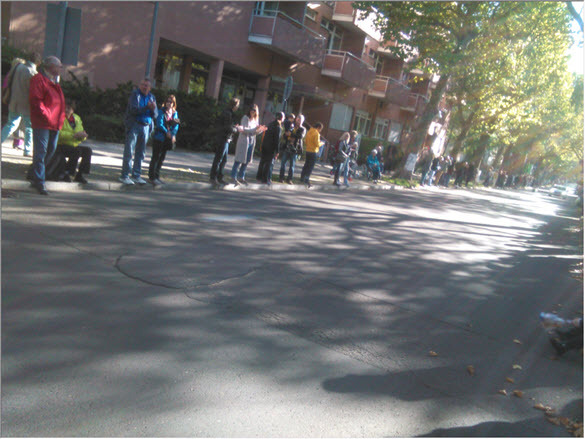 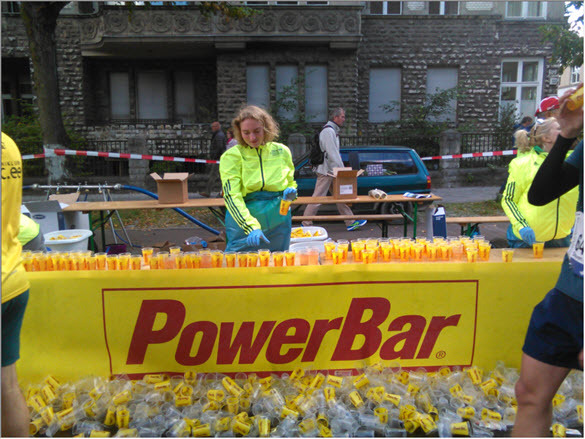 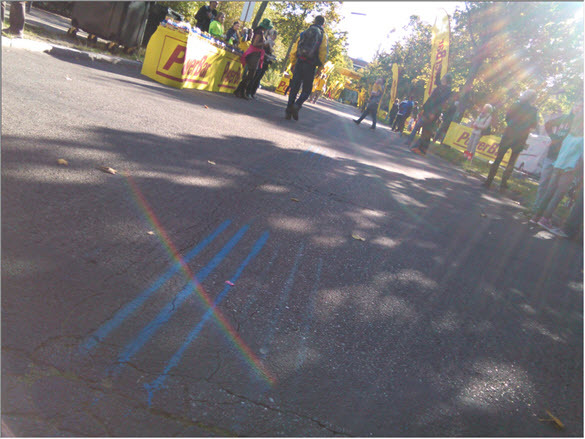 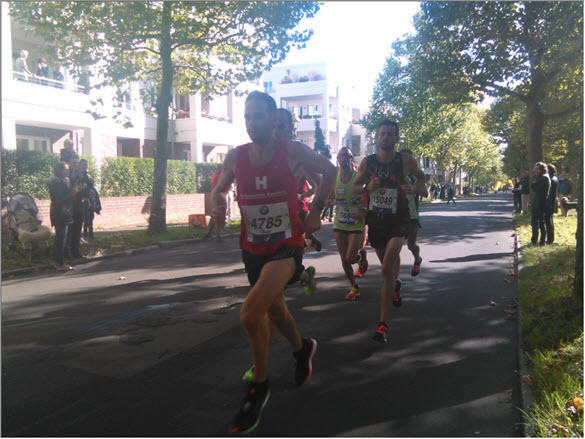 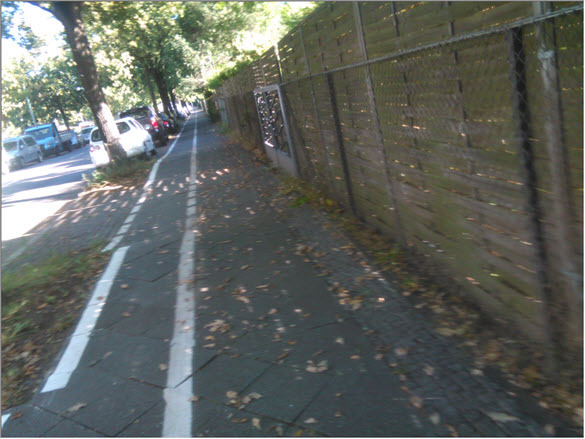 I took off at 9:00 AM, the exact time the starting gun went off for the elite runners of the Berlin Marathon in Tiergarten. 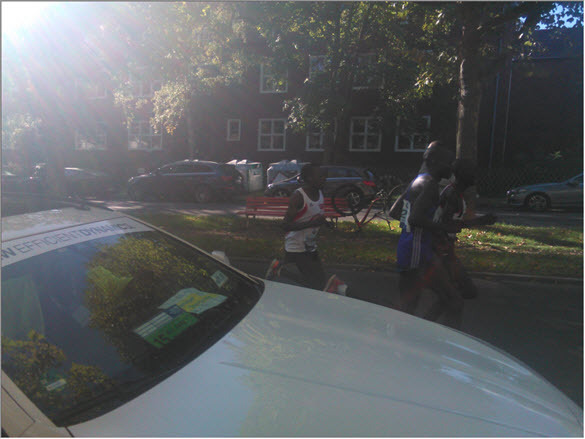 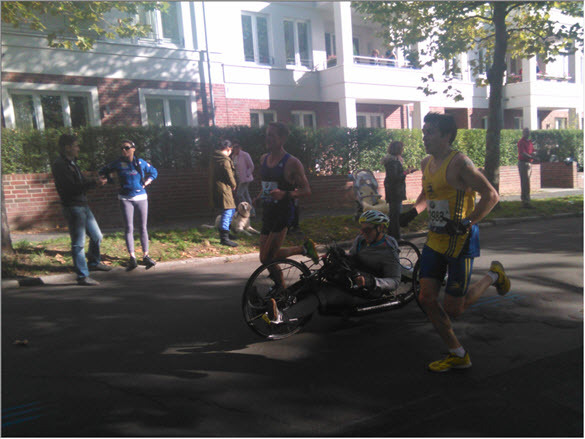 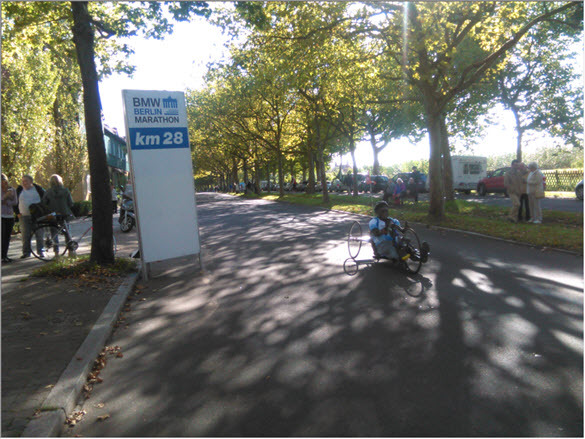 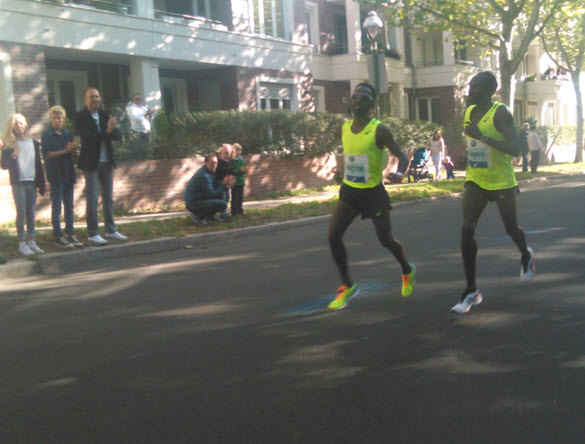 At 10K of my run, I had reached the 28K marker on the marathon route just in time to see the last of the hand bikers peddle past, and about 10 minutes later the impressively fast elite runner pack led by Kenya's Eliud Kipchoge who later won the race with a 02:04:00, missing the world record by 63 seconds. 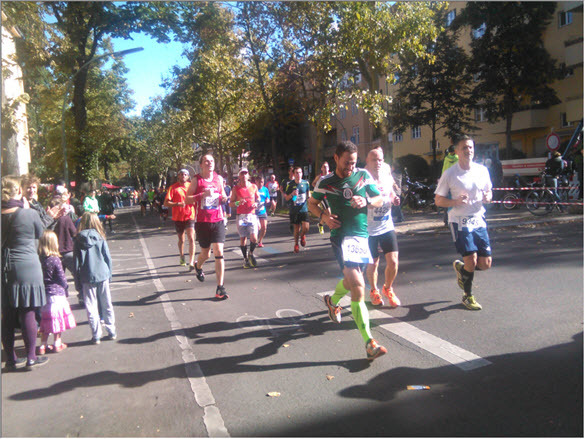 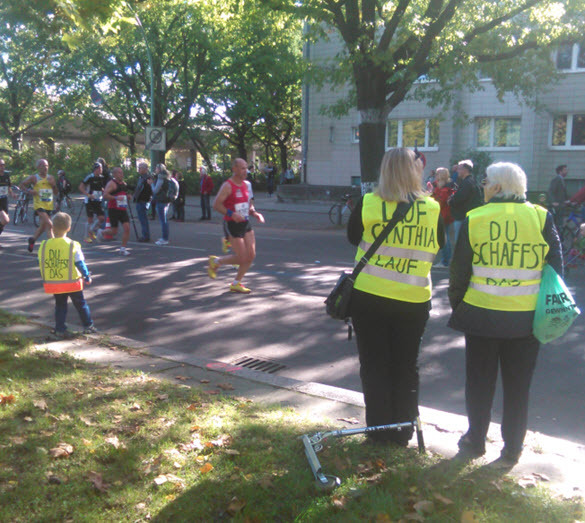 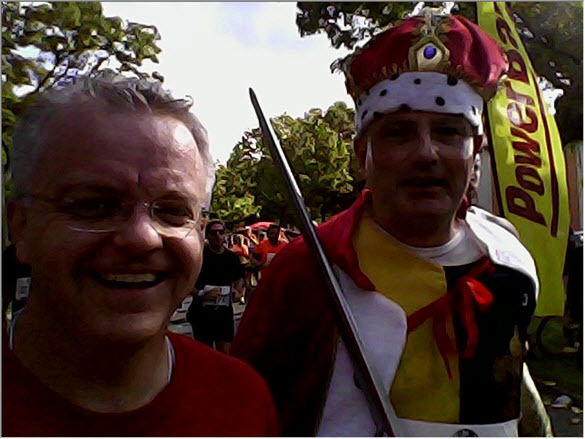 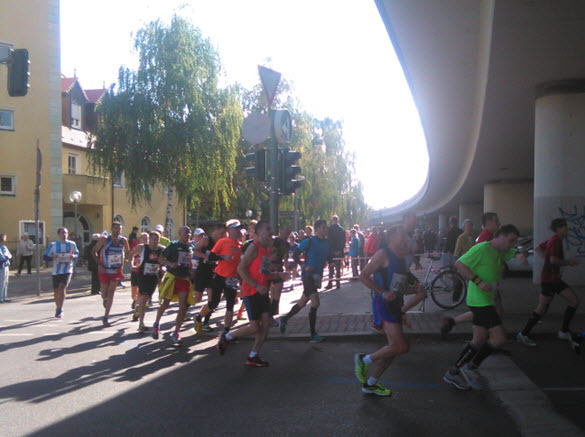 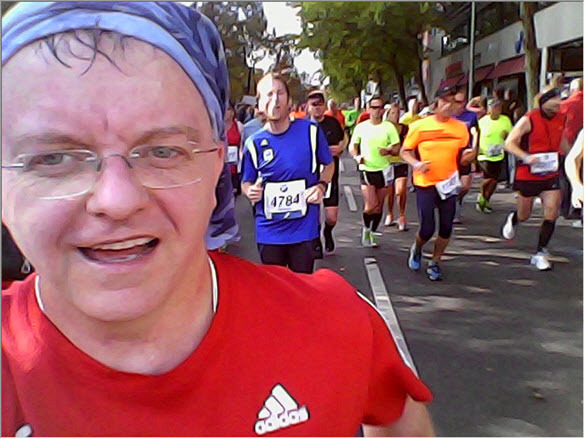 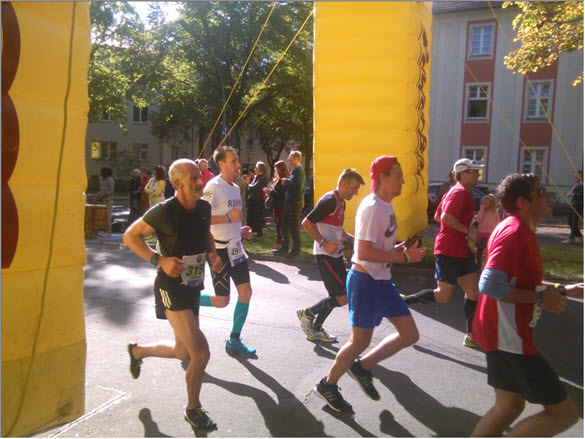 I then ran down to 26K to see if I could find my friend Matthias running his first marathon, waiting in some wonderful sun, a perfect day for a race: cool and sunny. 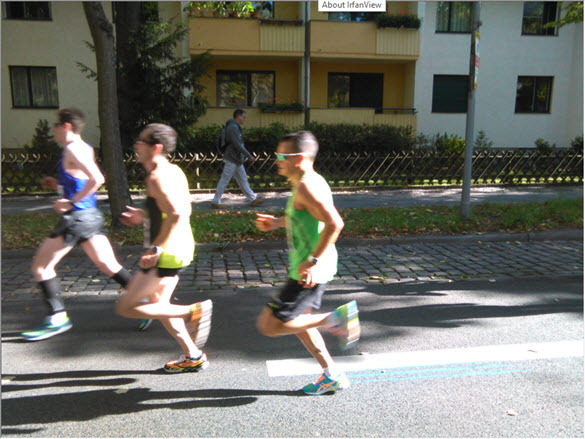 When I saw him we ran for a bit, I took some photos, then I let him continue trucking at his impressive 5:30 pace. 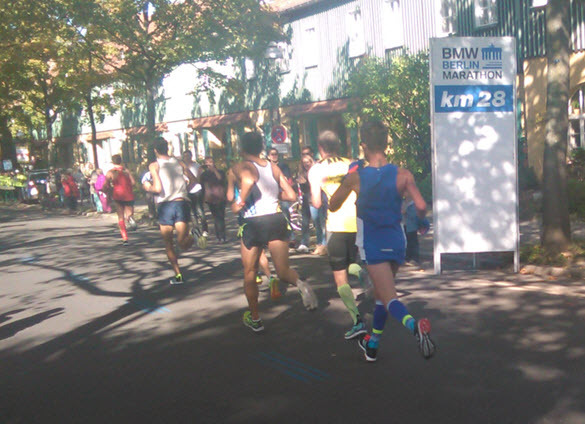 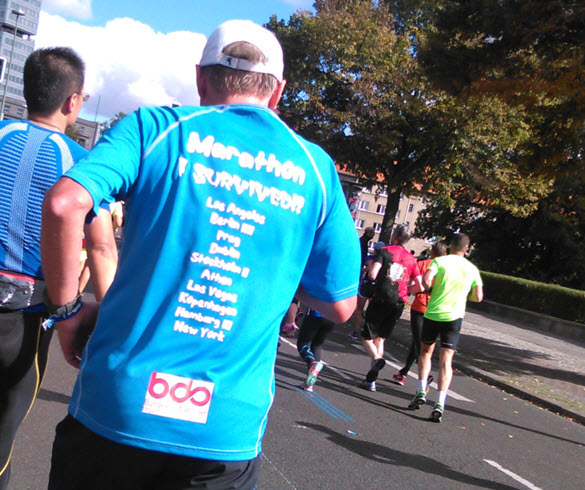 He ultimately got a 04:05:13, just short of a sub-four but still a very impressive time for a first marathon. 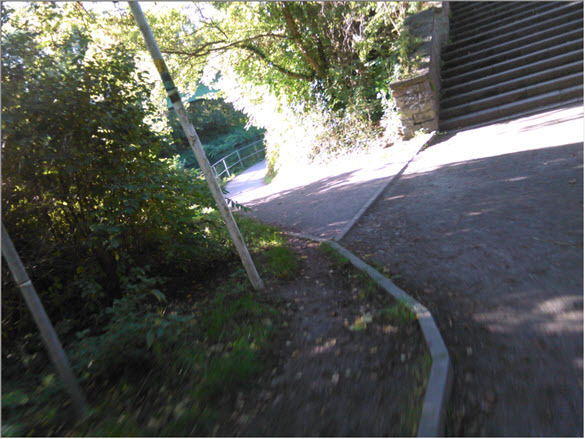 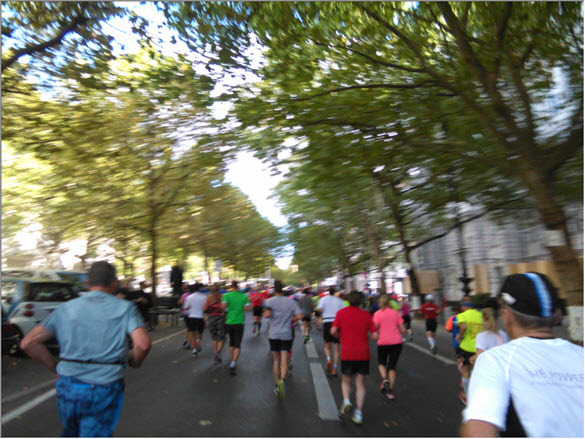 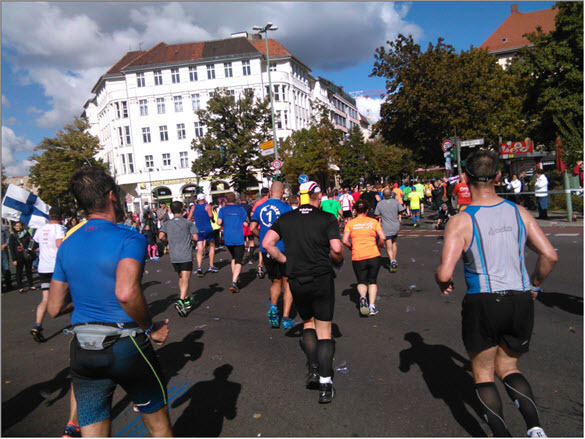 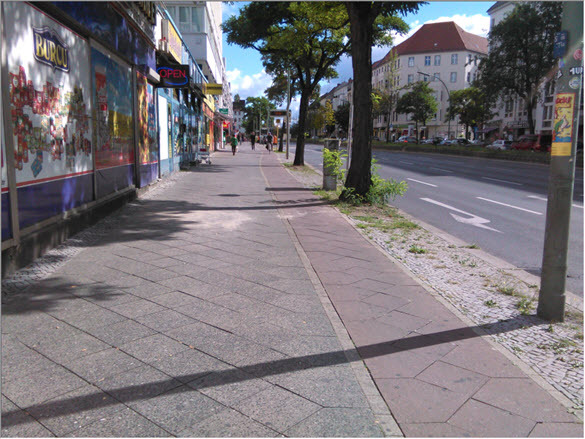 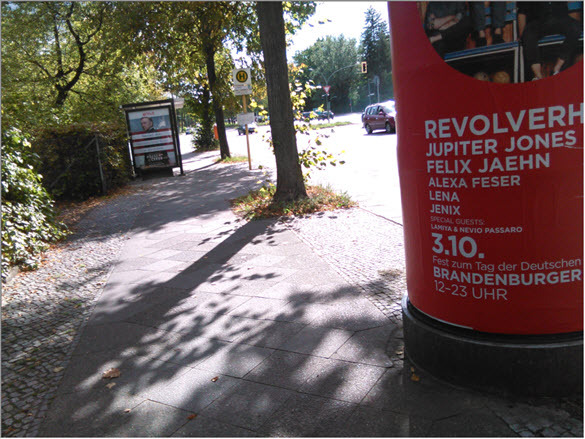 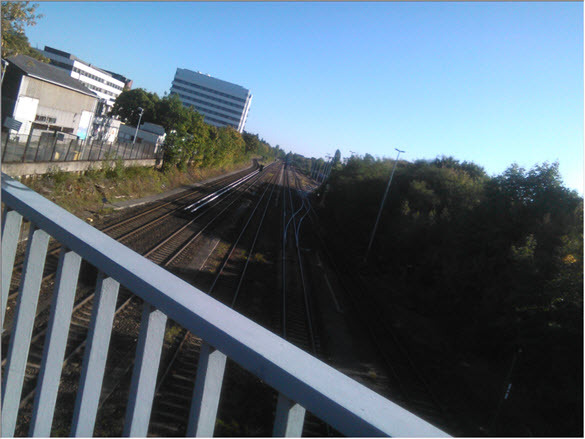 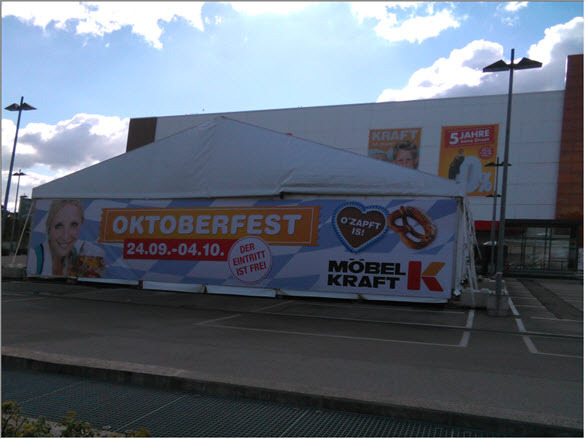 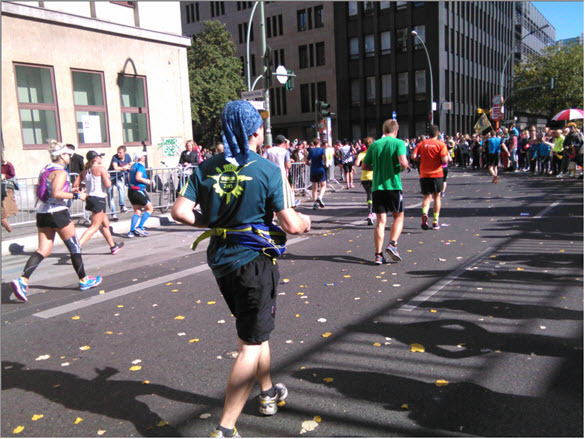 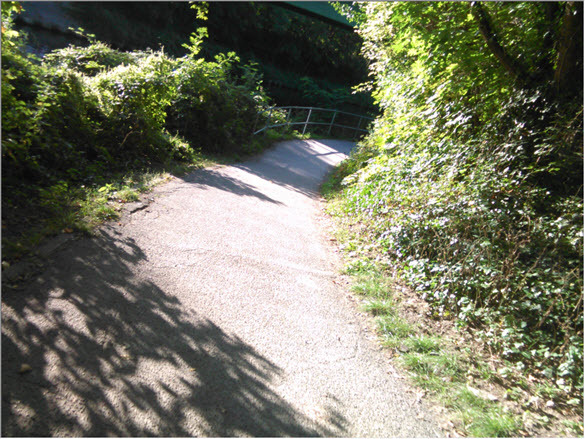 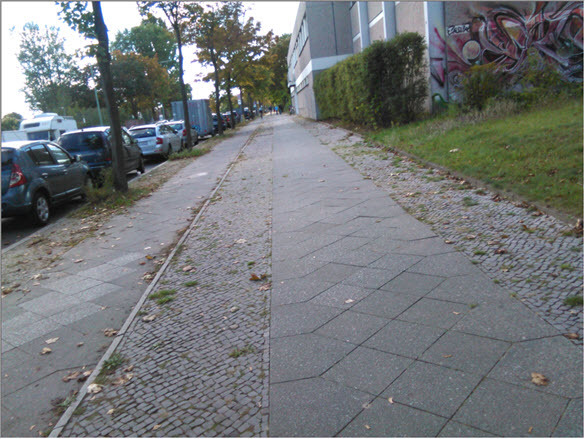 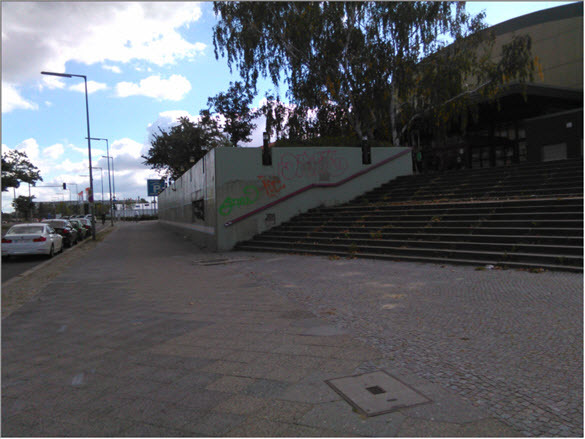 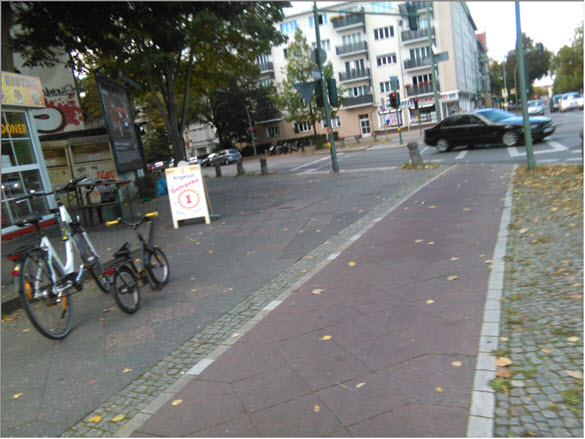 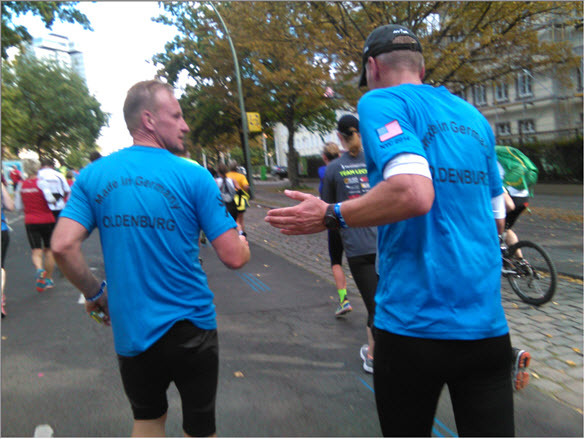 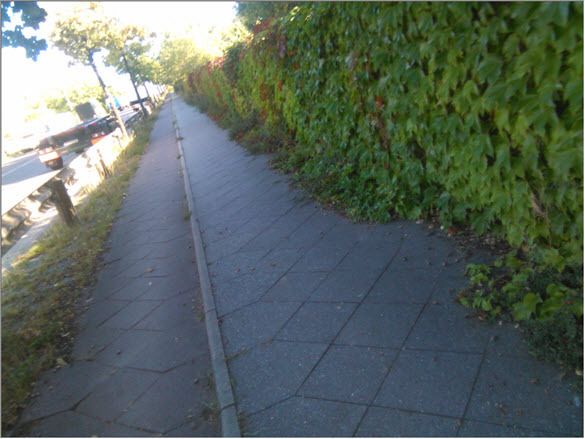 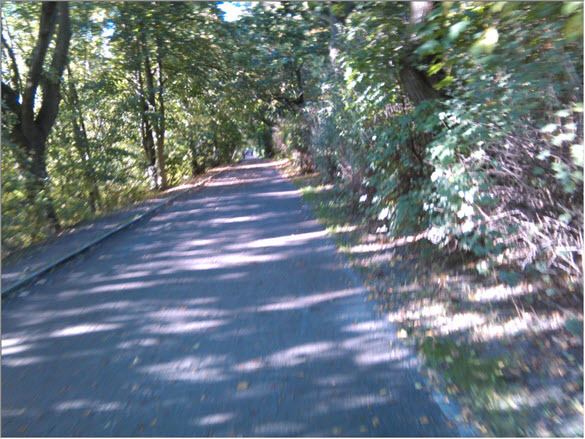 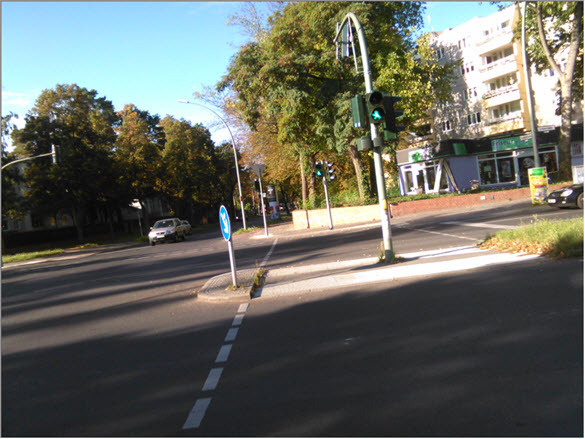 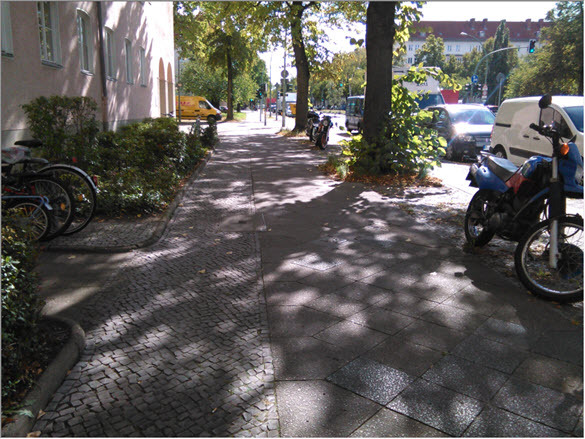 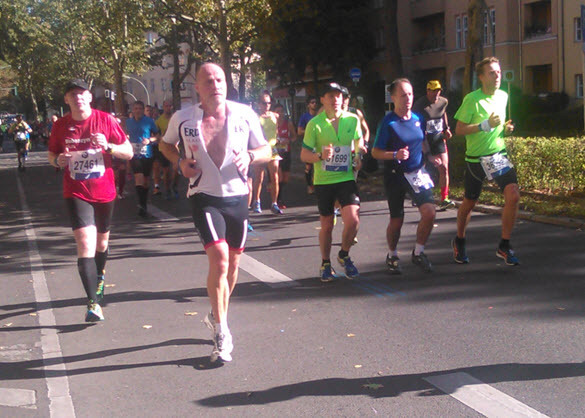 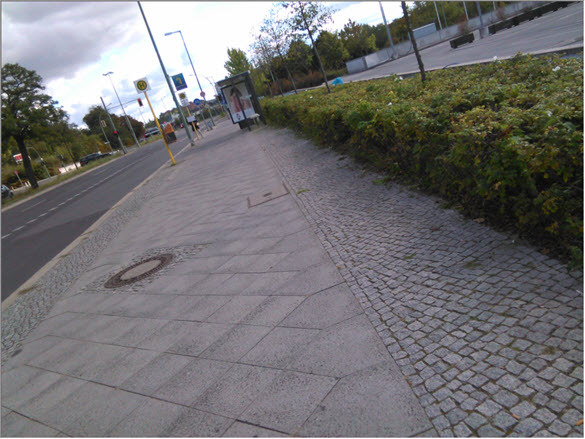 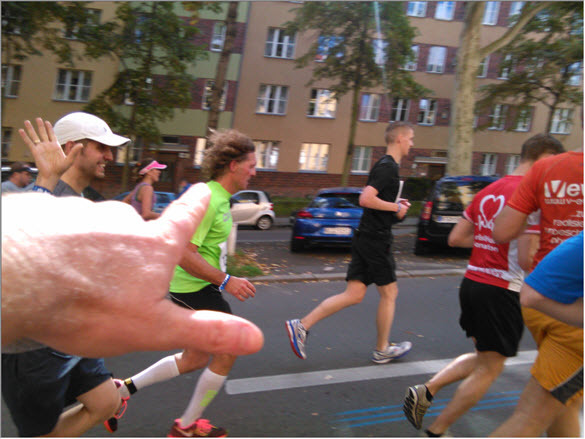 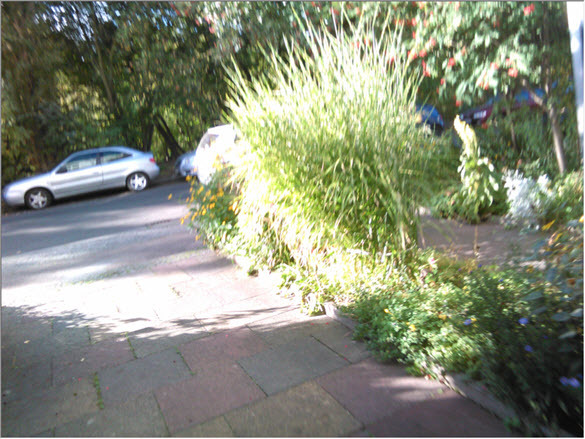 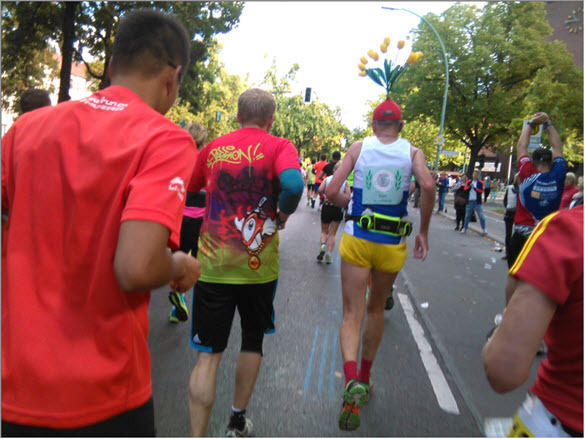 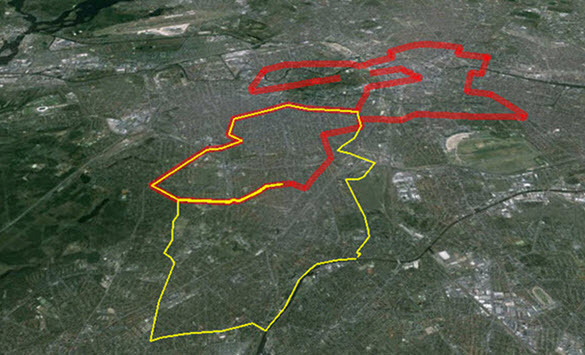 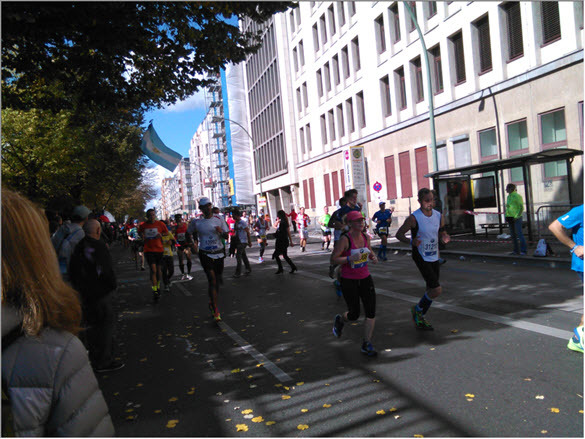 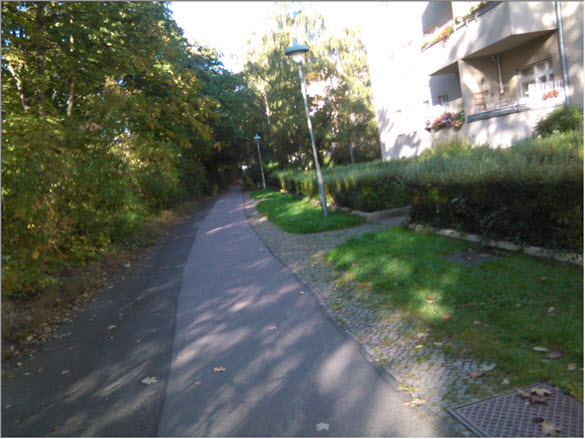 At 26K, I continued my training run by assimilating into the runners, enjoying the energy of the Berlin Marathon and massive cheering crowds and bands, then at 36K when they all turned left on their tired legs up toward Potsdamer Platz, I turned right in the direction of home. 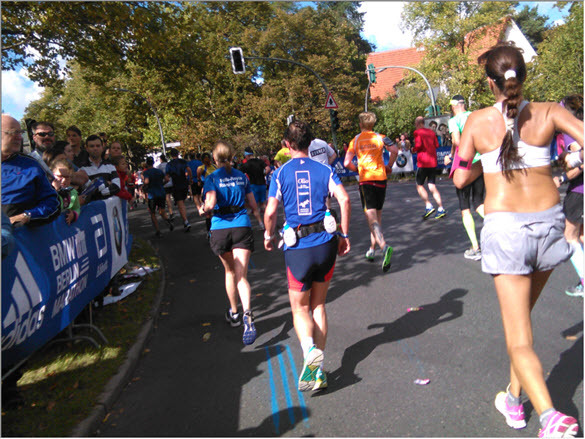 Running by myself again all of a sudden seemed quite lonely, but it was nice to have connected with the mass energy of the Berlin Marathon again, which brought back many memories of that race and weather-wise it was an absolutely gorgeous day to run, cool wind and warm sun.